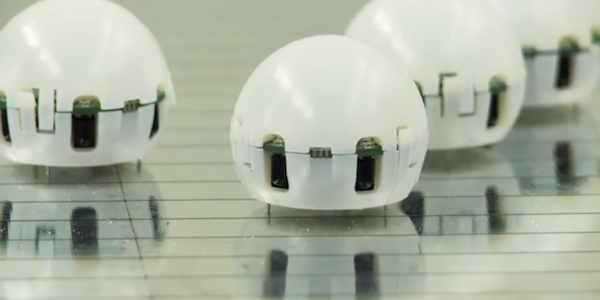 We have developed a new swarm robotic platform that falls in size, cost and capability between Harvard’s kilobot and the e-Puck. The Droplet is almost spherical, can self-right after being poured out of a bucket, and has the hardware capabilities to organize into complex shapes with its neighbors due to accurate range and bearing. Droplets are available open-source and use cheap vibration motors and a 3D printed shell. Infinite experiments due to a powered floor that doubles as global communication medium for swarm programming. We needed to pull a couple of tricks to get this done, which are described in detail in our upcoming ICRA1 and IROS2 papers. Figure 1. The Droplets are slightly larger than a ping-pong ball. The open shell provides insight on a set of RGB sensors and LED, and a 6-way infrared and bearing system. The lower shell also holds vibration motors that are opposite to the robot’s legs, which provide a connection to the powered floor. The way most robots do range and bearing is to abstract the robots as a point light source from which infrared rays emerge. This approximation makes the math relatively simple, but works poorly when the robots are too close together. For this reason, most range and bearing systems (such as that of the Khepera III or e-Puck) have a certain minimum range. It is also notoriously difficult to use the same infrared channel for both ranging (via intensity measurements) and communication. This requires dedicated electronics that give access to the raw signal and demodulation. We solve this problem on the Droplets by using two receivers: one that has a built-in 38kHz demodulation circuit (as used in TV remote controls), and another that provides us with the raw amplitude. In order to overcome the limitations of a point source approximation, we measure the incoming infrared from another robot’s emitter using all six receivers (as opposed to just one); we do this for all six emitters, leading to a 6×6 matrix of measurements. Using a two-step approximation1, we show how this data can be combined with accurate sensor and receiver characteristics to calculate not only the bearing to the other robots, but also its heading, and eventually the range. The advantage of this method is that an emitting robot can provide range, bearing and heading information to as many robots as can simultaneously hear it, making this approach much more scalable than other techniques that must exchange mutual bearings to calculate heading. Figure 2. Experimental results for range, bearing and heading1. You get reminded that using vibration motors for locomotion might be a good idea whenever you see your cell phone scooting of the table. Controlling its direction is hard, however, and omnidirectional motion using three motors has been thought to be only possible by carefully synchronizing all motors phases – something close to impossible with cheap hardware. The Droplets solve this problem by positioning the robots not above a leg, but opposite to it2. Instead of using the inertia of the vibration motor’s mass to lift a leg, the Droplets use their motors to lift the opposite side of the leg, which let the robot pivot around its legs. While this solves the physics of the problem, another challenge that comes with cheap vibration motors is that they are, well cheap, and all spin at different frequencies, with different weights, and even different directions. The Droplets solve this problem by using an overhead camera for one-time calibration. An optimization routine finds the right offsets and gains so that the Droplets move in as straight as possible a line and turn on the spot. Figure 3. 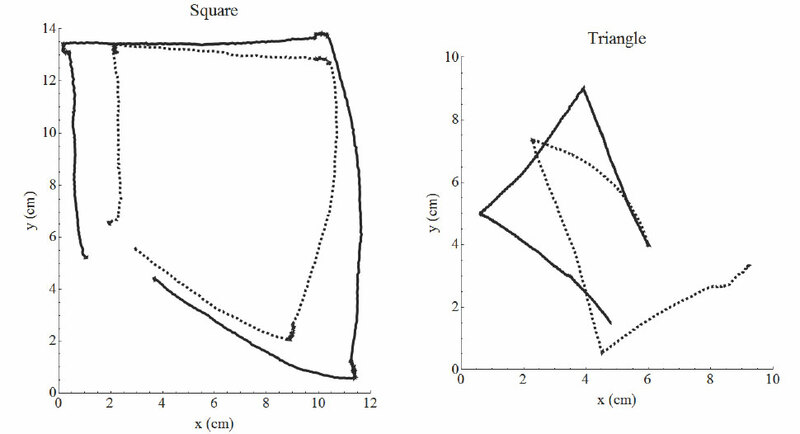 Two experiments showing the trajectories of Droplets aiming to drive in a perfect square by doing 90 degree turns (left) and sliding while maintaining their heading to drive in a perfect triangle, both experiments are open-loop control2. The ultimate challenge in swarm robotics is to recharge and reprogram hundreds, if not thousands of individual robots, and this is also why experiments at this scale are very, very rare. Although some platforms allow the robots to dock themselves on a charging platform, they actually need to reliably know when to do this and interrupt what they are doing. The Droplets solve this via a powered floor that is equipped with alternating stripes of positive charge and ground. Supercaps allow the Droplets to remain powered also during “airtime” or when navigating the small gaps between each stripe. In order to detect the unlikely case to stand directly on a gap – which is not a good resting spot – the robots can measure the voltage at each of its legs. We are currently working on using this feature for data transmission, enabling programming an entire swarm not only via infrared but directly via the floor. Being a feature-rich platform in a robust package, small form factor, and low cost (the powered floor is a simple 2-layer printed circuit board) could make the Droplets an ideal educational platform, enabling instructors to tangibly teach subjects such as organic chemistry (with each Droplet being a wiggling atom), geometry (with Droplets measuring angles and distances between them), or the spread of infectious diseases. Using the robots together with an overhead projector allows projecting an RGB coordinate system or environmental features such as obstacles, making the robot approximate the power of its much more expensive and larger peers. For more advanced roboticists, implementing odometry via the floor, neighboring robots at known location, or signals projected from above, might make for interesting challenges that allow teaching concepts like error propagation, the Extended Kalman Filter and SLAM. Come see our upcoming presentation at ICRA in Hong Kong this coming Wednesday at 3:40pm in s429, or next September at IROS. Download the Droplet simulator and come up with cool swarming algorithms on your own. Help us to make a thousand Droplets by naming a Droplet, donating an educational package to a K-12 institution of your choice, or branding an injection molded shell. Follow us @correlllab to stay tuned on how to make your own. N. Farrow, J. Klingner, D. Reishus, N. Correll (2014): Miniature Six-channel Range and Bearing System: Algorithm, Analysis and Experimental Validation . In: IEEE International Conference on Robotics and Automation (ICRA), Hong Kong. J. Klingner, A. Kanakia, N. Farrow, D. Reishus, N. Correll (2014): A Stick-Slip Omnidirectional Drive-Train for Low-Cost Swarm Robotics: Mechanism, Calibration, and Control. In: IEEE/RSJ International Conference on Intelligent Robots and Systems (IROS).